The Flag Tower is situated behind the Western wall of the Inner Ward...hidden from view when walking the walls of the city of Chester. The photo below shows a view of the inside of the wall, with a gun port visible to the left of the tower. The Flag Tower can be seen with a rectangular door or opening, and an arched door or opening. Its flat roof is level with the top of the wall. It is thought that the Flag Tower may have been one of the original parts of the Norman tower, and would have stood at the summit of the motte, almost in the centre, possibly surrounded by a wooden palisade. 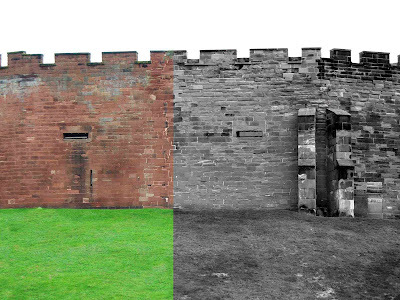 When the palisade, along with most of the wooden defences at the castle, was replaced with stone walls, the wall was built in line with the Western wall of the Flag Tower making it invisible externally. The tower would originally have been much taller, but the top floors have been removed at some point in the past, possibly when the castle was turned into an artillery fort. 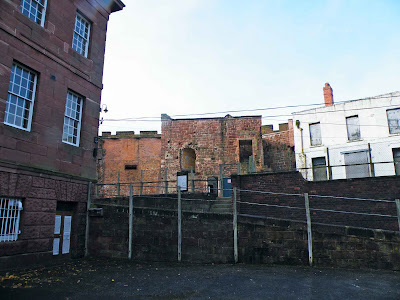 The photo above shows a view of the castle's wall looking from Castle Drive. The Flag tower has been reduced in height so that it is indistinguishable from the castle wall from the exterior. The colour portion of the photo shows where the tower is.